I didn't plan to post anything else about the whole Foley situation, since it's been beaten to death already, but I found this post on boingboing and it really ties into what I was talking about. 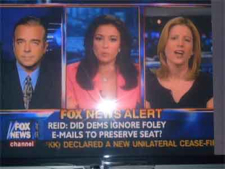 Fox News twice incorrectly listed Foley as a Democrat. Twice. ... and down the memory hole it goes. Yeah I saw that on Drudge but it's strangely dissapeared and I can't find it in the 'recent headlines' section either... Hmmmmm... Anyway I'm sure someone at the Fox 'behind the scenes' department slipped that in, but I doubt it was a big thing.